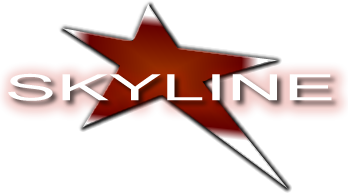 Cirque Bicycle Act - Cirque - Skyline Talent & Events - Exclusive representation for Cirque USA. 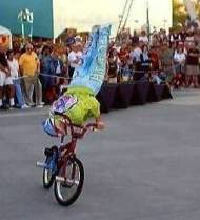 This act gets rolling with difficult maneuvers, turns and spins on one wheel, and tricks such as G-turns, boomerangs and mega spins, all accompanied by lots of fancy footwork. 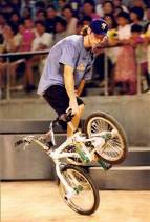 Our artist rides over obstacles without ever putting his feet down, hops up and down steps and into the audience on one wheel, and even jumps over audience members before coming to a graceful stop. His unbelievable stunts earn him well-deserved applause and accolades with each incredible performance. 6 Minute Act or 2x20 Minute Sets of Strolling Atmosphere (16ft height required 24 X 24 Orlando, Colorado, Las Vegas & LA.